Minister Halligan (left) launches EDGE with Richard Twohig, EDGE Programme Manager, and Professor Linda Doyle, Director, CONNECT. 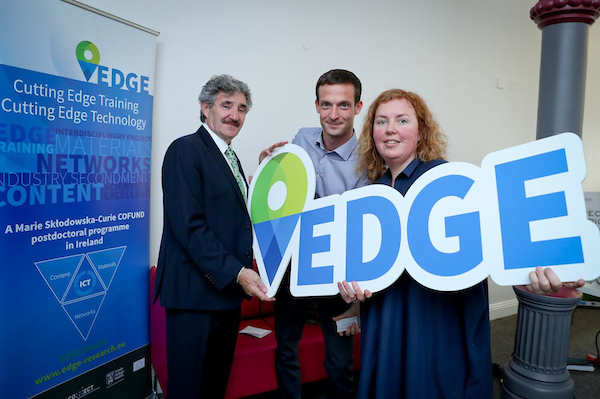 Minister of State for Training, Skills and Innovation, Mr John Halligan, TD, has launched EDGE, a new third-level ICT research programme that will recruit over 70 postdoctoral candidates to Irish Higher Education Institutes. The programme is co-funded by the European Union under the prestigious Marie Skłodowska-Curie initiative and Science Foundation Ireland. EDGE will be delivered as a partnership of three Science Foundation Ireland Research Centres which are multi-institutional but hosted out of Trinity College Dublin: CONNECT, AMBER and ADAPT. The current call for applicants is open until 1 December 2016 with the first EDGE Fellows beginning their work in June 2017. Additional information on the EDGE programme can be found at http://edge-research.eu. CONNECT is the world leading Science Foundation Ireland Research Centre for Future Networks and Communications. CONNECT is funded under the Science Foundation Ireland Research Centres Programme and is co-funded under the European Regional Development Fund. We engage with over 35 companies including large multinationals, SMEs and start-ups. CONNECT brings together world-class expertise from ten Irish academic institutes to create a one-stop-shop for telecommunications research, development and innovation. CONNECT is funded under the Science Foundation Ireland Research Centres Programme and is co-funded under the European Regional Development Fund. Website © Connect Centre 2016. All rights reserved.